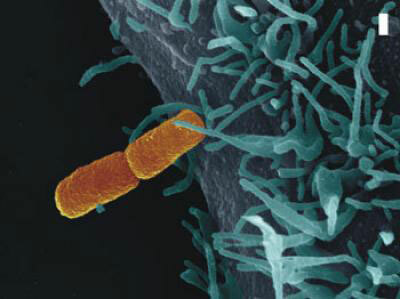 (Nanowerk News) For a successful infection, bacteria must outwit the immune system of the host. To this aim, they deliver so-called virulence factors through a transport channel located in the bacterial membrane. In some bacteria this transport channel is formed like a syringe, enabling them to inject virulence factors directly into the host cell. Scientists from the Max Planck Society and the Federal Institute for Materials Research and Testing have now succeeded for the first time in elucidating basic principles of the assembly of this transport channel ("Protein refolding is required for assembly of the Type three secretion needle"). This is an important starting point for the development of new drugs that might interfere considerably earlier than antibiotics in the course of infection. Every day the human organism is confronted with a huge variety of pathogens. Most of them are fended off by our immune system. To execute a successful infection, bacteria must therefore manipulate the host to ensure their survival. They secrete virulence factors through a transport channel located in the bacterial membrane. Some bacteria, such as the causative agents of dysentery, food poisoning, typhoid fever, and pest, have developed a specialized transport mechanism called the Type three secretion system. 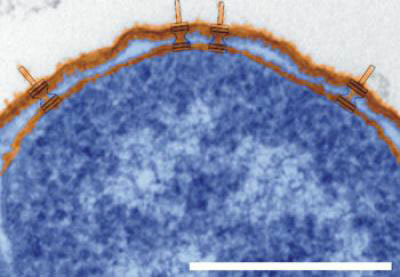 Electron microscopy reveals that this structure is formed like a syringe: the base of the syringe is imbedded in the bacterial membrane and the needle protrudes out of the bacteria. With this apparatus bacteria can inject virulence factors directly into the host cell. So far, little has been known about how bacteria build this nano-syringe. Scientists from the Max Planck Institute for Infection Biology in Berlin, the Max Planck Institute for Biophysical Chemistry in Göttingen, and the Federal Institute for Materials Research and Testing have now succeeded in elucidating fundamental principles of the needle assembly. This was made possible by reconstitution experiments which allowed them to study the assembly of proteins into a needle in the test tube. The close observation of these events revealed how the proteins are assembled into a syringe: the bacterium synthesizes the proteins in the cell interior, transports them through the syringe to the outside, and stacks them one after the other onto the tip of the growing needle. The scientists could also show that the proteins change their three-dimensional structure during the assembly process. They were able to pinpoint the exact structural changes down to the single amino acid level. These results open new perspectives in the development of medicines that might interfere in the course of infection much earlier than antibiotics. These so-called anti-infectives could inhibit the assembly of the needle and the injection of virulence factors into the host cell. This would be a major advantage over antibiotics, which have to travel through the membrane into the bacteria to be able to kill it. Furthermore, antibiotics cannot distinguish between good and evil, i.e. disease-causing, bacteria, often leading to unwanted side effects. Lastly, the use of anti-infectives would circumvent the problem of antibiotic resistance development. The change of the three-dimensional structure of the proteins during the needle assembly was analyzed by X-ray structural experiments at BESSY in Berlin and ESRF in Grenoble and NMR-spectroscopic experiments based on radio waves at the Max Planck Institute for Biophysical Chemistry. The scientists compared the three-dimensional structure of the needle protein before and after the needle assembly.